The extra-large oven capacity of the Hotpoint 30 in. Freestanding Gas Range makes it easy to prepare a variety of dishes for special occasions or everyday family meals. The range's 4 all-purpose burners accommodate nearly all of your cooking needs. Standard grates help keep pots and pans securely in place, while the cooktop's recessed design and sealed burners help contain spills for easy cleanup. Hotpoint combines easy-to-use features with practical design to complement any kitchen. These appliances have been created to affordably meet the needs of busy lives. We just moved into a rental home. I don't know how to use the oven..when I open the oven door. It is warm. Is there a pilot light? Or do I need to light the oven myself somewhere?? Help! IS THIS STOVE ENERGY STAR? Because of the electronic pilot...I would consider it energy star rating. I looking hotpoint cooktop only? I looked and Hotpoint doesn't make a gas cook top. Sorry. what are the actual outer dimensions of this appliance? 4.8 cu. ft. Gas Range in White is rated 4.0 out of 5 by 31. Rated 4 out of 5 by CaTrekker from I got this stove a few days ago and it was installed without a hitch. The delivery team(3rd party... I got this stove a few days ago and it was installed without a hitch. The delivery team(3rd party through HD) was very polite and courteous. HD's automatic machine called me a day before delivery and gave me a window time. The two guys called 1 hour before they came within that window time. I also got a nice gas line kit which had everything I needed except a new shut off valve, which I wanted to get on my own. It's a very basic range that one would typically use in a rental or an apartment. The electric cord isn't too long but it was able to reach our outlet. I actually like stoves without a clock or computer. It's just basic and it works! I like how it comes with an anti-tip bracket, which is very important if kids are around the house since they like to climb up after opening the oven door. The burners just lift off, and it looks like if one gets clogged, you'll have to replace them as a set. Not bad. Apparently, there is one with a battery vs a plug, but I'm glad I got the one with a plug. Also, in the back right(as pictured) they give you extra tips if it gets clogged or something! The top lifts up nice and easily and two metal arms lock it into place. Rated 2 out of 5 by Bella from This range is as basic as it gets. Don’t get me wrong it works just fine. The biggest thing I d... This range is as basic as it gets. Don’t get me wrong it works just fine. The biggest thing I do not like is there is no light in the oven. You either have to use a flashlight to see how your food is cooking or take it all the way out losing all your valuable heat from the oven. Another is there is no clock. My other stove I replaced had a clock and you don’t realize how much you use it until it is gone. The good thing is there is no pilot light in the oven it is a battery lit type. The burners on the cooktop do light by the clicky type starter so no matches are needed. So all that said it does cook adequately and is a very low price if that is what you need. Installation was very easy. Rated 5 out of 5 by Gwhizz63 from Such outstanding service delivering our new Hotpointe 4.8 cu. 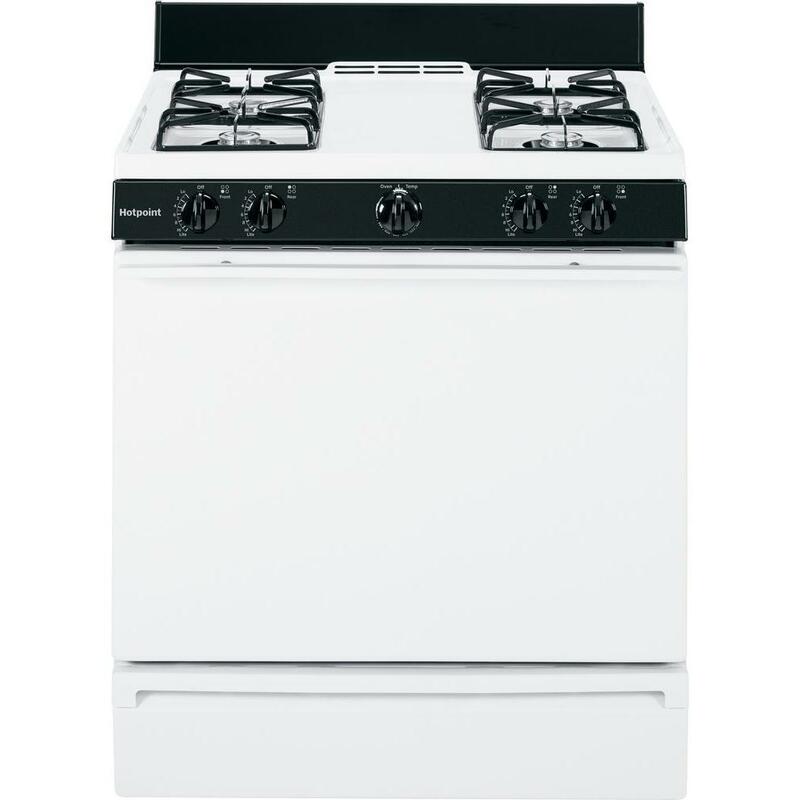 ft. Gas Range in White. The delive... Such outstanding service delivering our new Hotpointe 4.8 cu. 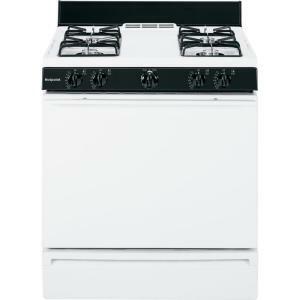 ft. Gas Range in White. The delivery crew was very polite, everything was scheduled ahead of time and right on schedule. Removal of old unit, hookup of new unit with new connections. Testing and confirming that all was safely hooked up and working correctly. Even a follow-up call to make sure we were satisfied with everything, My wife loves the new stove, easy to clean, large strong flames on all four burners,It is a very simple unit without any bells and whistles like clocks and lights. Large oven for baking and nice little broiler, all works great. If you order a new stove, highly recommend the delivery service. Rated 3 out of 5 by Pete from This is as simple of a range as you are going to find. There is no clock, no oven temperature dis... This is as simple of a range as you are going to find. There is no clock, no oven temperature display, nothing but an oven and four burners. That being said, it works just fine if all you need are the basics. I installed this in my basement that has a small kitchen area. I didn't need anything fancy, just wanted something that works and this fit in quite nicely. I gave it a 3 star rating because it is exactly that, average. Sometimes average is all that is needed. Rated 5 out of 5 by BuyerBeware22 from The bisque is a little lighter in color than I expected, but that has nothing to do with the perf... The bisque is a little lighter in color than I expected, but that has nothing to do with the performance of the range. This is a basic gas range, exactly the right kind of thing to put into a budget rental with a gas hookup in the kitchen. The top lifts up to clean the burners well, There are six positions to slide in one of the two oven racks (end users will typically only take advantage of one or two), a broil drawer, and no window in the oven door. You can do all basic baking, broiling, and stovetop cooking with this range. It's not partciularly energy efficient, but if your tenant pays utilities, you don't need it to be. It may not last quite as long as pricier models, but I've seen gas stoves just like this last for twenty years of normal use. Rated 1 out of 5 by Cathy from I bought this to replace the original (GE) range that came with my 45-year old double-wide mobile... I bought this to replace the original (GE) range that came with my 45-year old double-wide mobile home. I searched all the new stoves available and kept coming back to this one which was the most like the original GE range. The features I love about this stove are the wide space between the burners, and the low, receding back plate that matches my backsplash height, and most importantly---allows extra large pots to sit at the back and still be centered on the burner, and that all the burners are powerful so you can put pans in any position on the range. My large frying pans, stock pots, canning kettles, pressure cookers, and pressure canners can safely sit at the back, slowly cooking, and out of the way, allowing me to safely cook other things on the front burners at the same time. Also, I find that the dials located in the front are so much safer to use than those with the controls at the rear. You never have to reach over hot boiling pots or frying pans. By the way, I raised four kids and never had a problem with them using the front dials improperly. I taught them to cook at age three and to be aware of the dangers of a stove. I also prefer the broiler in the drawer below the oven. The oven stays cleaner and the large free space allows plenty of room for a 24-pound turkey or for cooking large batches of bread or cookies. The oven cooks very evenly. Rated 5 out of 5 by Baze from Delivery and installation of the oven went very smoothly. It’s a good basic oven without all the... Delivery and installation of the oven went very smoothly. It’s a good basic oven without all the bells and whistles that come with digital ones. The temperature intensity can be controlled by adjusting the stove with east to use simple knobs. Front handle has a large enough space from the oven that you can hang a towel from it. Stovetop cleans up easily and all the gas burners lit up quickly. The oven is actually a decent size and big enough to hold a med-large turkey. Unfortunately there is no timer, so when baking, you need to keep track of the time.